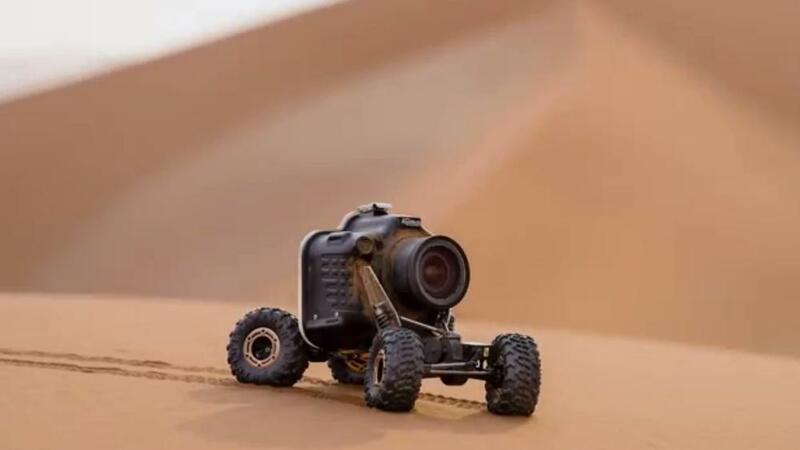 We’ve seen what could happen if you get too close to wildlife, but one photographer has found a way to get close without getting too personal by employing a remote control buggy that doubles as a camera rig. Photographer Chris McLennan was able to capture awesome images of lions in the wild using a Nikon D800E attached to a four-wheeled vehicle, remotely controlling it from a safe distance. But what happened to the buggy during the shoot again shows why we should never approach wildlife of any kind. After a photo safari where he was confined inside a vehicle, McLennan thought of some way he could get closer to animals. The idea came to him in the form of a four-wheel-drive buggy – dubbed the “Car-L” – with a modified AquaTech sound blimp to encase the DSLR with an 18-35mm lens. The important thing was that the camera had to be dust- and lion-proof, McLennan said. McLennan, who photographs for Nikon, HP, and other companies, tested the buggy on a trip to Botswana, where he remotely sent Car-L into a pack of female lions and one male from 66 feet away. He was able to photograph the male lion with no incident, but the female pack was more curious about the strange vehicle heading toward them. Car-L wasn’t able to make an escape, and the pack descended on the little vehicle. Eventually the lions retreated when they realized Car-L wasn’t so tasty, but amazingly the camera survived intact, although there was a lot of damage to the rig. But McLennan was able to walk away with great photos and his body still in one piece. Check out the video below in which McLennan documented the entire experience.